His Holiness Patriarch-Catholicos Ilia II of Georgia, the most beloved and trusted man in the nation, has celebrated his 57th mass Baptism ceremony at Holy Trinity Cathedral in Tbilisi, the site of the Georgian Orthodox Church reports. 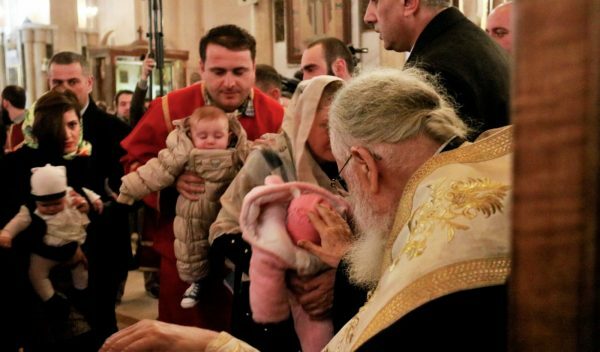 The Sacrament was celebrated in Holy Trinity Cathedral in Tbilisi on January 20, with another 630 newly-baptized becoming the Godchildren of the Patriarch. His Holiness baptized more than 700 children at the previous ceremony in late November. Every child was given a Baptismal cross and a certificate of Baptism. Altogether, Pat. Ilia now has more than 37,800 Godchildren. With the first mass Baptism on January 19, 2008, Patriarch Ilia commenced his initiative to help improve the dire demographic situation in Georgia caused by post-Soviet abortion rates. Such mass celebrations are held four times a year in which the primate personally baptizes and becomes the Godfather for the third and later children of married Orthodox couples. According to the latest statistics, the country has a population of 3,718,200. According to the forecast of the United Nations Population Fund (UNFPA), this number may drop to 2,985,000 people by 2050. Pat. Ilia has been the primate of the Georgian Church for 41 years. At the time of his enthronement, there were 15 dioceses and only 30 active churches left thanks to communist persecutions. Today there are 47 dioceses and about 2,000 active parishes, as well as about 3,000 clergy.